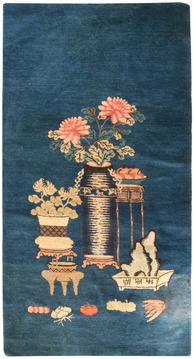 Traditional Chinese rugs and carpets are immediately recognizable by their simple, classic motifs and unusual colors. 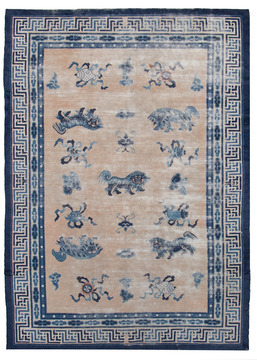 These rugs often feature a center, circular medallion; familiar objects seen in nature such as animals, flowers, and clouds; stylized Chinese ideographs; and even entire scenes. They're usually framed with a simple, wide border. 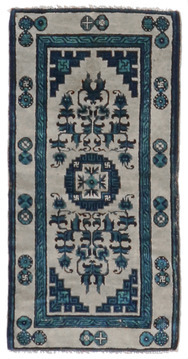 Chinese rugs are woven with a 5-ply yarn, in contrast with the 2-ply yarns used in Persian rugs and carpets. 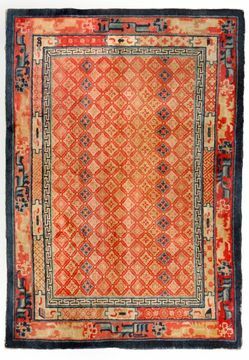 Many Chinese rugs and carpets are sculpted where contrasting colors meet to provide interest and texture to the simple patterns. 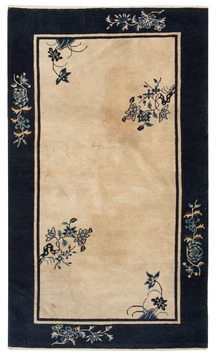 These rugs are usually of high quality and extremely durable.Chinese carpets, as apposed to most of the antique rug production were woven almost exclusively for internal consumption. 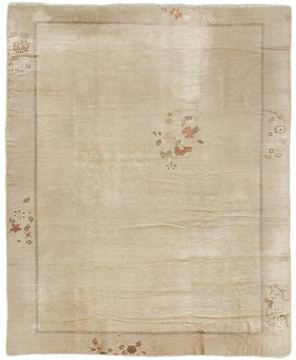 Since they were mostly sheltered from European and western influences offers us the reason why these carpets have a very unique truly ethnically Chinese in look and appeal. Only during the early part of the 19th century did they open their markets to the west (for rugs - they have been exporting porcelain, bronzes, wooden and other works of art for many years prior to the 19th century). It is during this period (the early 1900's and on) that we see a major and unmistakable change in the production, abandoning the traditional ornamental look to a more open and even art deco design. 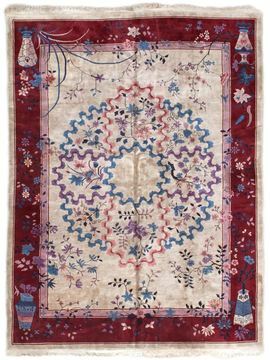 This shift in production brought with it a more commercial approach to the Chinese rug market with less attention to the quality and artistry of every single piece to more mass appeal look and price. This explains why there are so many of the so called art deco Chinese carpets in the market today. 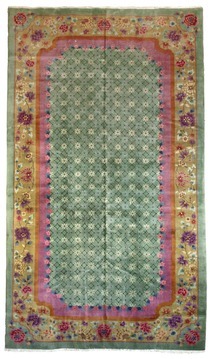 To attain the true essence of Chinese weaving one merely needs to compare the pre- 1910 production to the later ones. 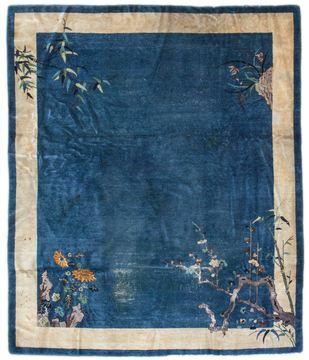 While the textile industry in China is rich in history and centuries old the earliest surviving examples of the craft are believed to have been produced during the time of Ch'ung Chen, the last emperor of the Ming dynasty who died during the first half of the 17th century. The Ming dynasty which followed survived until the creation of the Chinese republic in 1912. 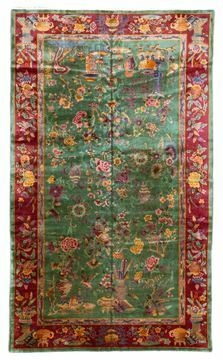 This would be a good time to note that while most rugs are attributed to a specific manufacturer or region, authorities and scholars attribute the age vintage of any specific rug to the ruling emperor of the time. 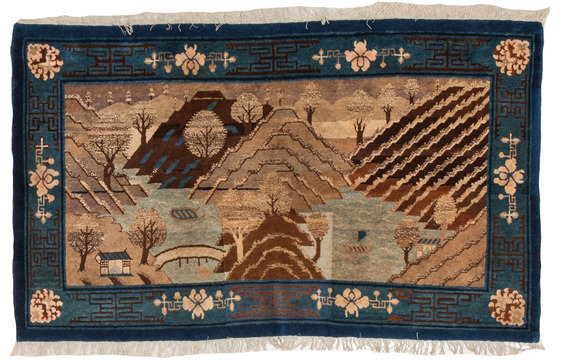 In stark difference from the other rug weaving origins, in China, the artistic impression far exceeded the importance of the quality of any said piece, the end result being that some of the beautiful pieces have coarser knotting. 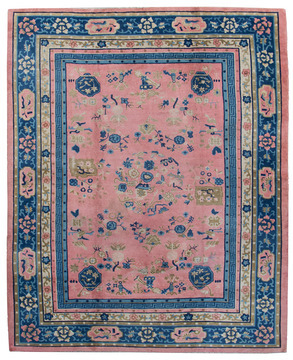 Rich in culture, history and folklore Chinese carpets incorporate design almost never seen in any other type of rug. Dragons, local art and ornamental objects are almost always a trade mark of these productions. 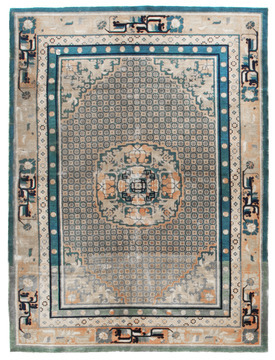 Widely seen in Chinese rugs one also finds the Pinyan Wan - (a symbol that has been associated with the horrible acts of the Nazi party) over 3000 years old this symbol, which even predates the Egyptian Ahnk, this symbol was used to represent harmony - dharma and the balance of opposites. 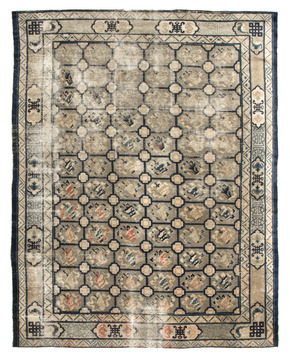 Chinese rugs are some of the most collectible rugs in the market today, sought after by collectors and consumers alike. 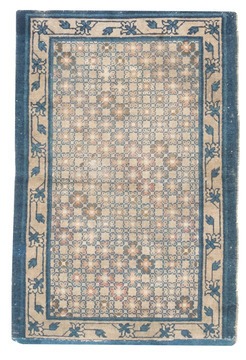 They are widely appreciated for their uniqueness for they truly look like no other rug... instantaneously taking the onlooker on a journey to a place and time that is far more simpler calmer than the world we live in today (thus achieving the goal of any truly great work of art).